What an interesting month this has been for observing birds in our garden! 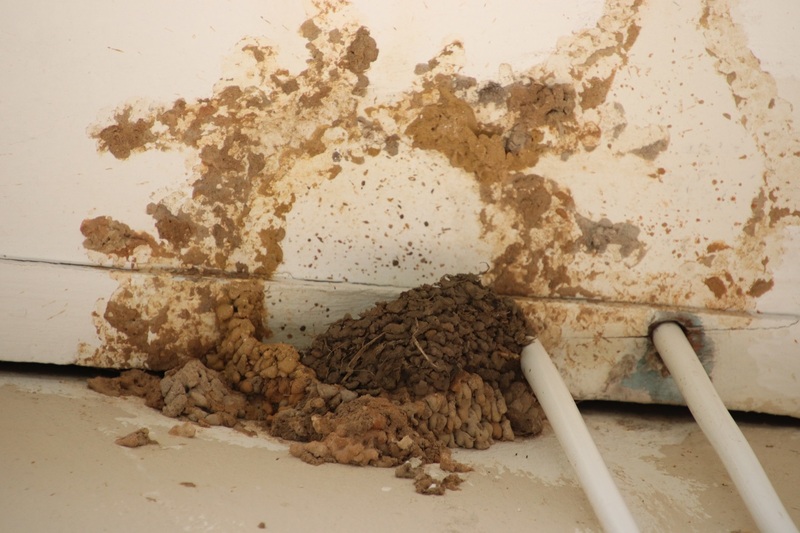 The Lesser-striped Swallows are making yet another valiant attempt at rebuilding their mud nest. Here we are, past mid-summer, and they have still not managed to complete a nest nor raise a family. Finding suitable mud in these drought conditions must be difficult – I suspect they collect it from the edges of the rapidly drying-up dam over the road. 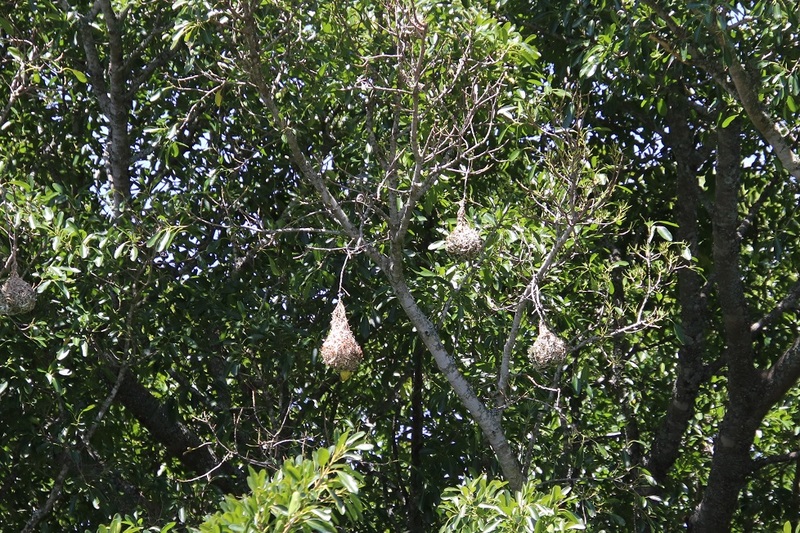 Despite several Village Weavers in varying states of maturity populating the garden, a number of them have recently been hard at work weaving their nests very high up in the Natal Fig. 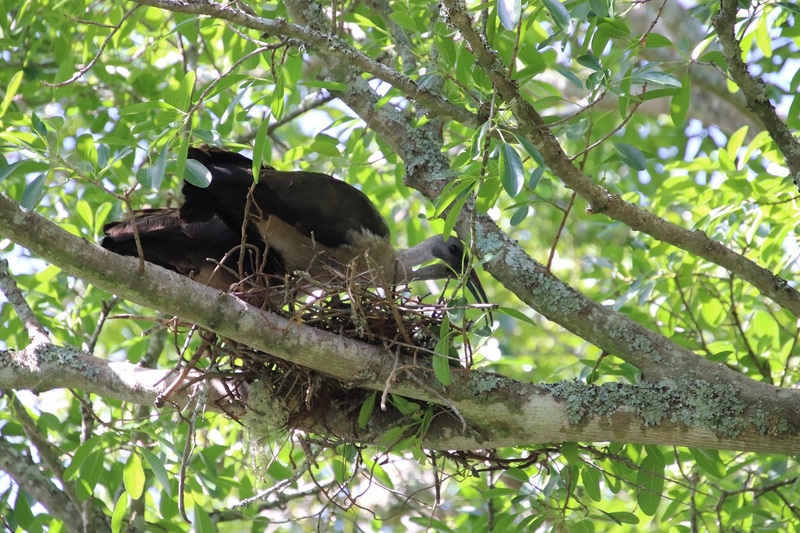 A pair of Hadeda Ibises are also nesting in the fig tree. The prolonged drought has resulted in a dearth of nectar-bearing flowers, making our nectar feeder so popular that I have been filling it twice a day for most of this month. 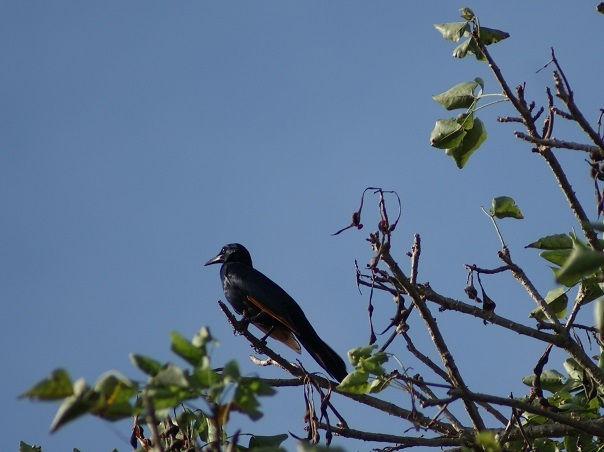 It is visited regularly by Fork-tailed Drongos, Village Weavers, Cape Weavers, Black-eyed Bulbuls, Amethyst Sunbirds, Greater Double-collared Sunbirds, Black-headed Orioles as well as a Spectacled Weaver. A pair of Red-winged Starlings began the month stuffing their beaks with apple flesh to take to their chick and, before long, were bringing their youngster to the feeding table to feed it there. It is now able to feed itself. 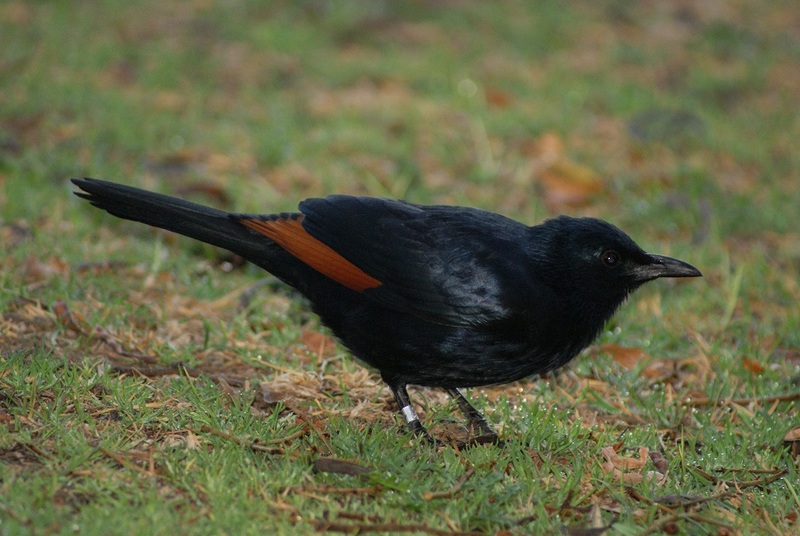 Life is not easy for birds: an alarm call from a Cape Robin had me interrupting our lunch to see what the problem was. 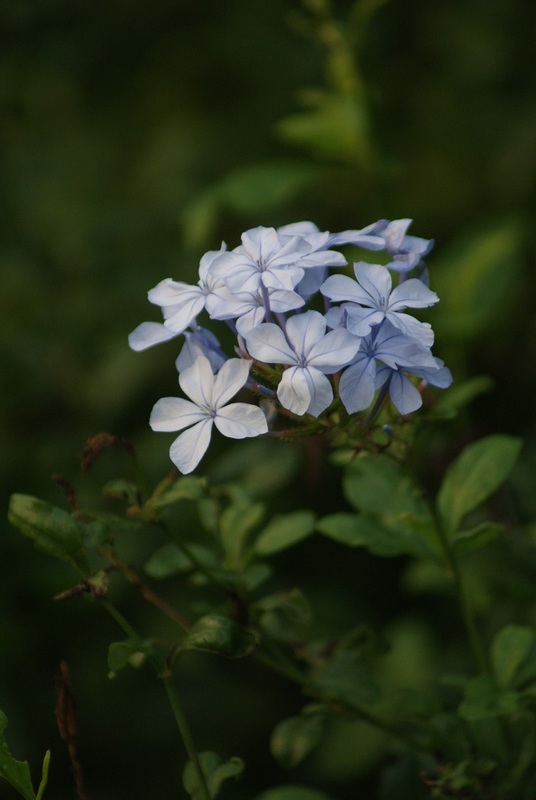 I approached the bushes outside the dining room very cautiously as I was met with a flurry of birds including a fierce-looking Bar-throated Apalis, an agitated Paradise Flycatcher, a Thick-billed Weaver and several weavers. I only managed to photograph the alarmed robin before seeing a Boomslang weaving its way sinuously among the branches just above my head – time to beat a retreat! 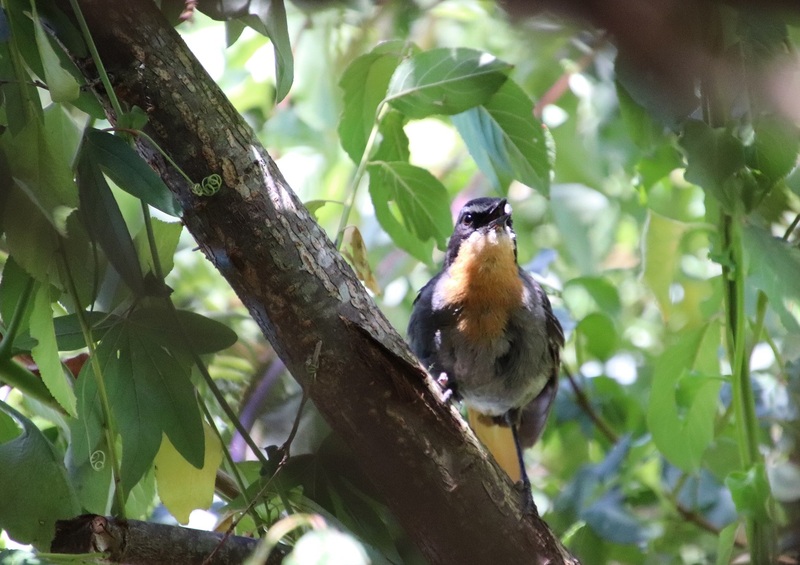 On a different occasion the alarm call of a Cape Robin, combined with the frantic chirruping of other birds, drew me outdoors towards the thick, tangled hedge of Cape Honeysuckle. 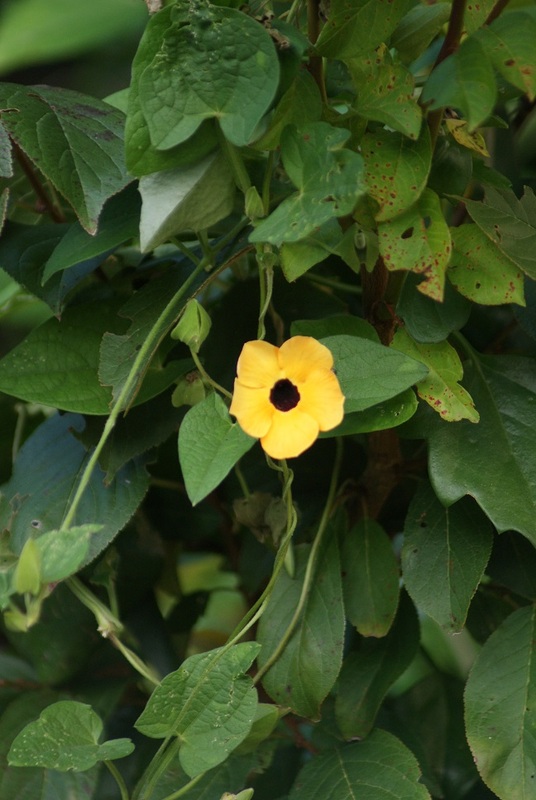 Mindful of snakes, I approached it very cautiously until I became aware of a distinctive clicking sound, kluk-kluk, which convinced me of the likelihood of finding either a Grey-headed Bush Shrike or a Burchell’s Coucal raiding a nest. It was neither. The vegetation as well as the hurried movements of Village Weavers, a Bar-throated Apalis and a particularly agitated-looking female Greater Double-collared Sunbird made photography nigh impossible. It was several minutes before I was able to ‘capture’ the nest-raider. 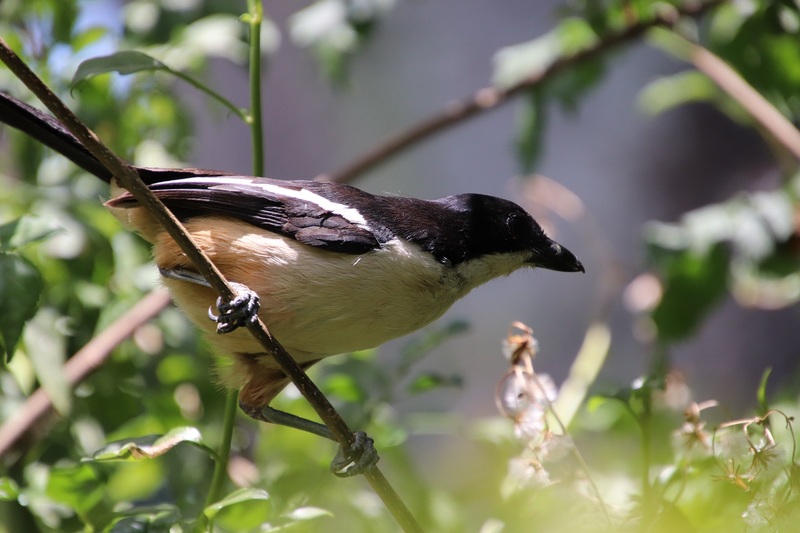 This time it was a Southern Boubou. 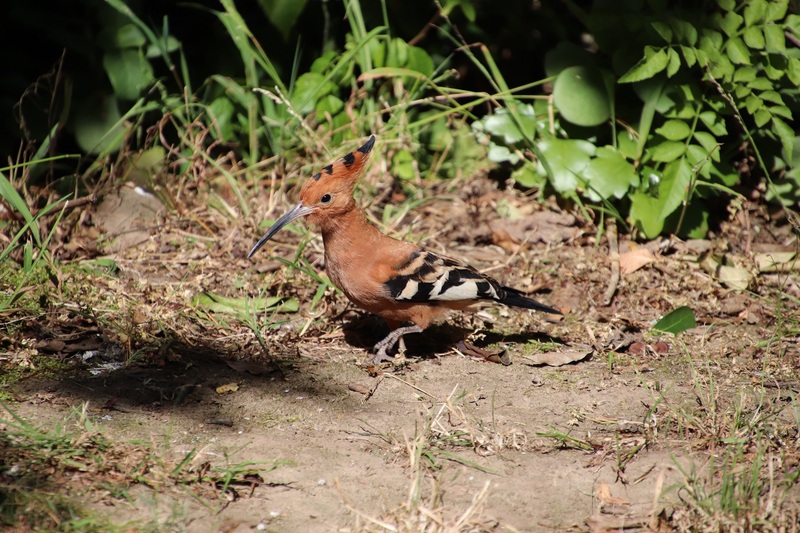 What greater pleasure could there be, just as the year is drawing to a close, to have not one Hoopoe visit our garden, but four! What a beautiful month this has been – no rain, sadly, but mostly clear skies with warm days and at night one can feel the winter chill moving in as if to say “Don’t be fooled, I am on my way ha ha!” The aloes coming into bloom are attracting the sunbirds: the Black Sunbird was seeking nectar elsewhere last month and is a welcome returnee, whilst the Olive Sunbird is making its annual fleeting visit. 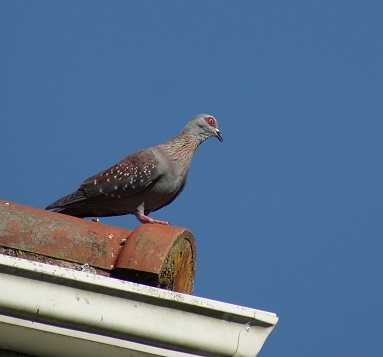 At least three pairs of Speckled Pigeons have settled under our roof to breed. There are always one or two standing sentinel on the corner. As the source of figs has dried up, the Redwinged Starlings keep an eye on the fruit I put out now and then. Here a female is making short work of her bite of an apple. 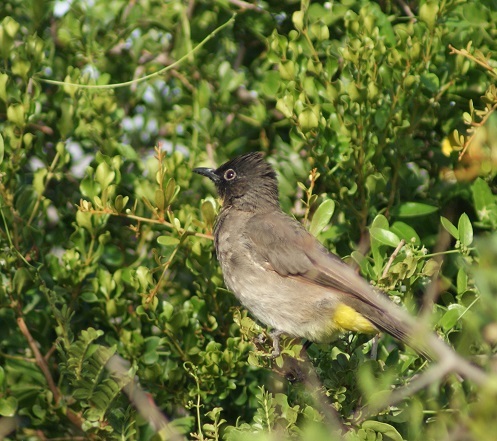 The Blackeyed Bulbuls also arrive soon after they spy the fruit on the feeding table. I was very surprised to see six Rednecked Spurfowl on a warm day mid-month. Here today and gone tomorrow they were, as was the look-in by a Cape Wagtail. It has been a month for raptors too: the African Harrier-Hawk is a fairly regular visitor and was joined this month by a Yellowbilled Kite and a Verreaux’s Eagle – all exciting to see. 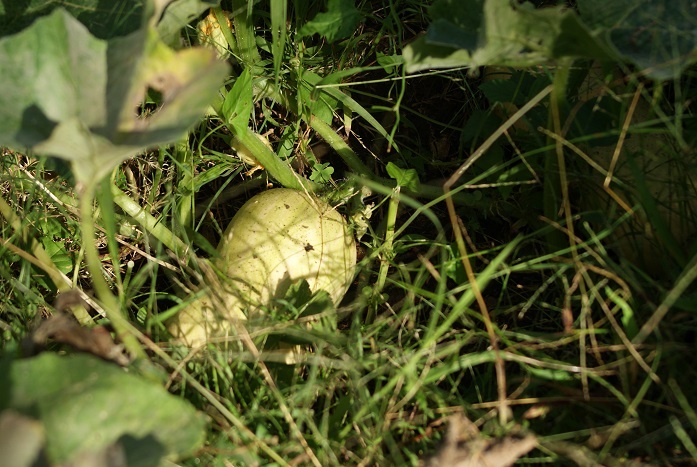 While self-sown butternuts ripen on their vines. In these years of severe water shortages, I bless the indigenous plants that simply ‘get on with it’ and do their best. What a bumper month this has been for seeing birds in our garden! 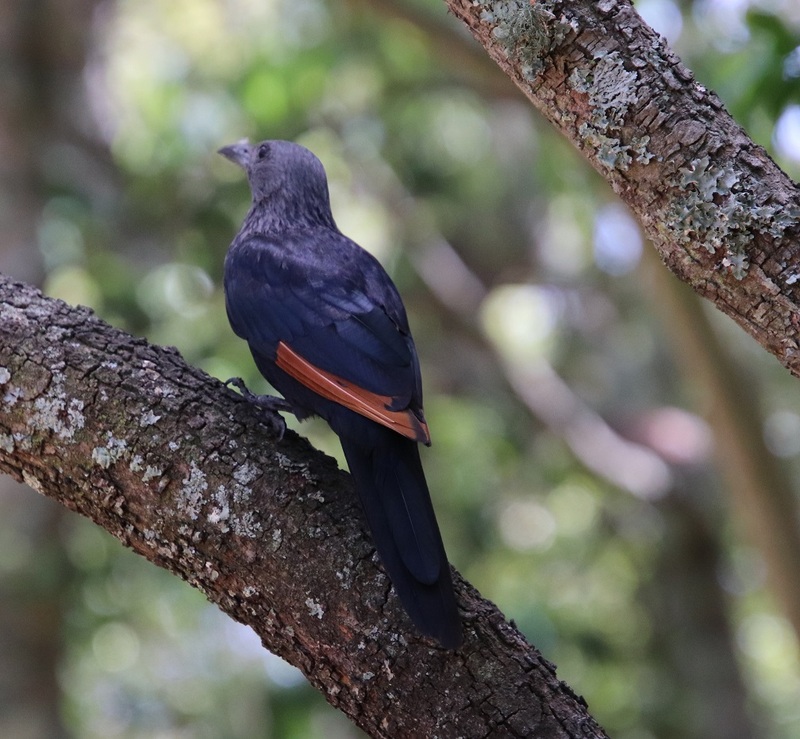 The Black Cuckoo could be heard long before it was seen; I have only had glimpses of the Paradise Flycatchers – which is not surprising as our garden consists of a tangle of trees and bush. Despite their name, Common Waxbill, these birds are not common in our garden and so their presence for several days running came as a pleasant surprise. Redbilled Woodhoopoes also paid us a flying visit, although I hear them calling around the neighbourhood far more often than I see them. The solitary Red Bishop that visits every now and then remains a mystery – where does it come from and why doesn’t it invite any of its mates to the bounty of food available in the garden? 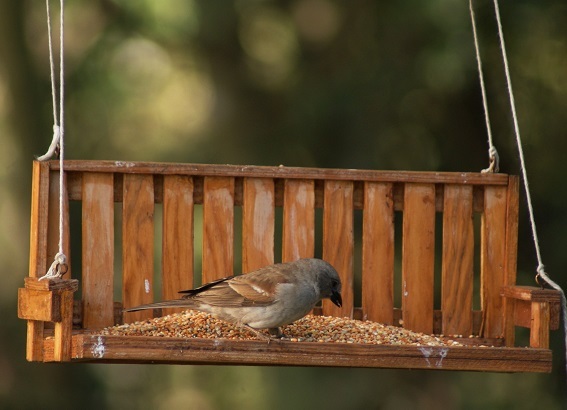 A pair of Grey-headed Sparrows come to inspect the feeding tray either very early in the morning – before the mass of assorted doves and weavers arrive – or to see what is left once the initial feeding frenzy is over. 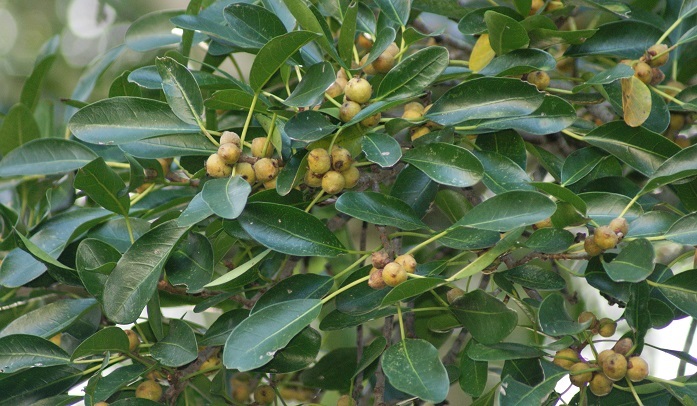 I recognise their ‘chirrups’ among the leaves well before they appear. There must be a lot of fruit around elsewhere for the Redwinged Starlings are not as prolific as they have been. Here a female has knocked an apple off the feeding tray to peck at on the ground. Watching birds in my garden has had to take second place this month in the wake of travels to Boksburg and Cape Town as well as hosting several visitors in between. With the increase of Laughing Doves (Streptopelia senegalensis) mentioned last month, it is no surprise that they were the first birds to be noted on my list. They are the most regular visitors to our garden throughout the year. Although I have never actually found one of their nests, they certainly enjoy the regular snacks available here! 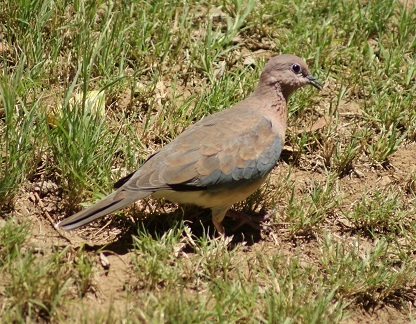 These doves walk rapidly across the lawn to find the seed I have scattered – or that has dropped from the feeder while the weavers have been feasting there. 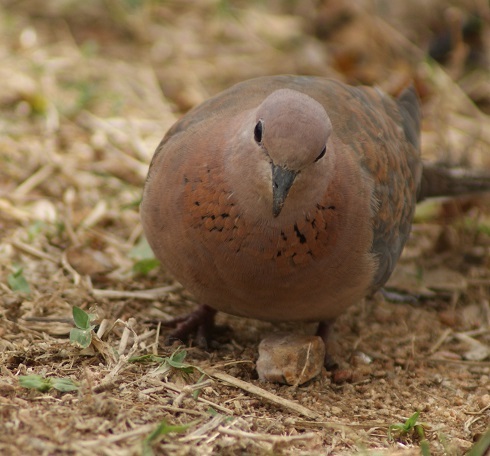 I occasionally see them pecking at the apples I put out and recently observed several Laughing Doves eating grains of jasmine rice. Although they mostly forage on the ground, more than one Laughing Dove has mastered the art of launching itself onto the swinging bird feeder (doubtless having watched the weavers doing this with ease) and clinging on for dear life while it manages to extract seeds for a very short while before giving up the balancing act. 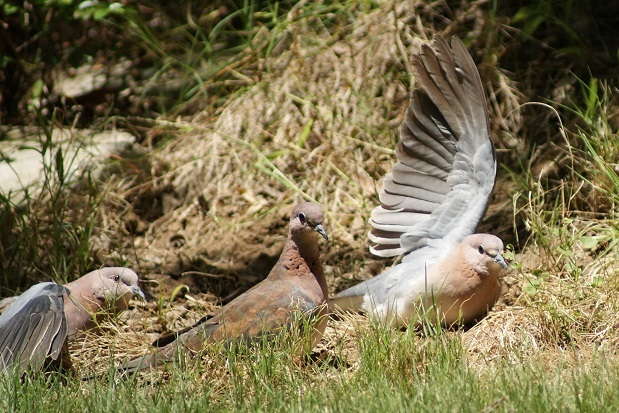 On hot dry days these doves scratch in a patch of open ground where they like to sunbathe, spreading their wings out or lifting a wing straight up – one at a time. I was interested to find that the specific component of the scientific name (senegalensis) refers to Senegal, where the bird originally described was caught for I tend to think of them being South African birds. I see they occur all over Africa. 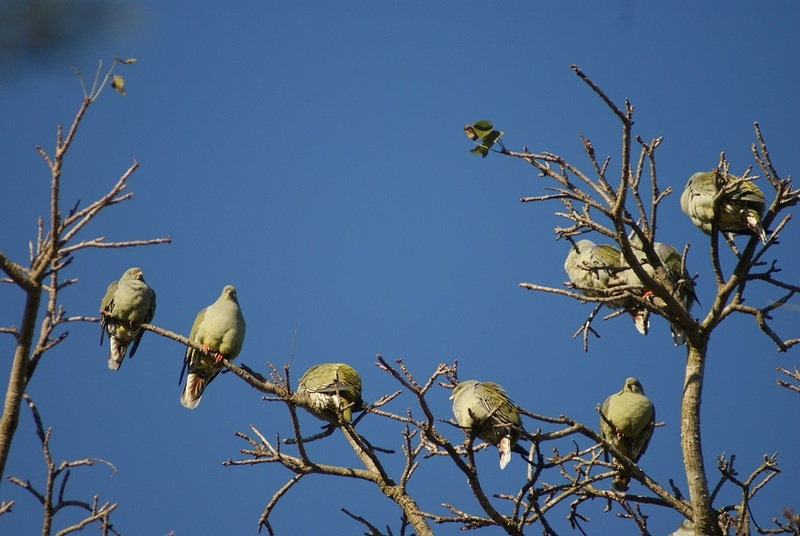 Now that the fig tree is bearing its first flush of fruit, the African Green Pigeons visit fairly often. They are best seen early in the morning and late in the afternoon, when the last rays of the sun highlight the top of the tree. Of course it is easier to photograph them in the bare branches of the Erythrina! Ever increasing flocks of Redwinged Starlings arrive daily to feast on the figs too. The coucals and cuckoos have gone and there are very few Whiterumped Swifts wheeling about the sky now – and even fewer Lesserstriped Swallows. Common Starlings make the odd foray into the fig tree and occasionally forage for seeds on the lawn. I generally see them in far greater numbers along the pavements and on the school sports fields that abound in this town. A Fiscal Shrike dominates the back garden, perching either on the telephone cable or the wash line. It seldom ventures into the front garden for some reason – kept at bay by the Forktailed Drongos perhaps? This morning I watched a Forktailed Drongo chasing Rock Pigeons all over the garden – what for? 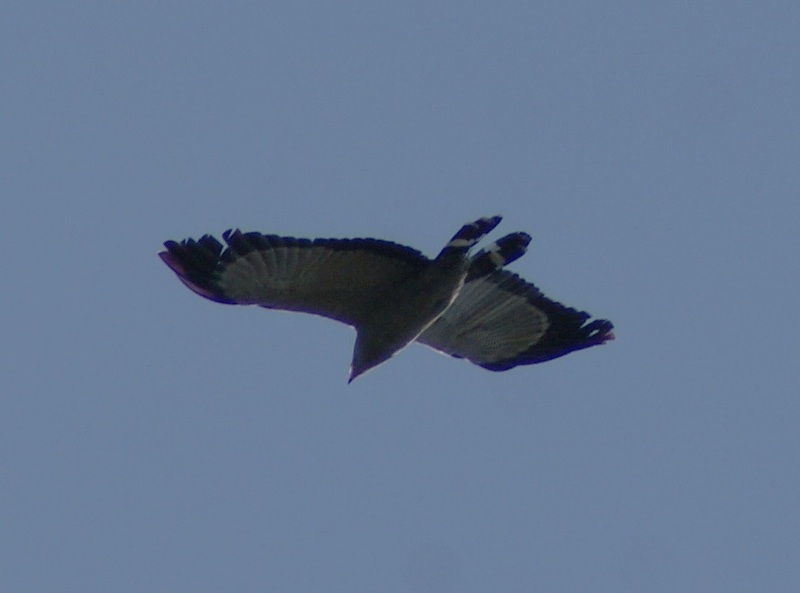 Both the Gymnogene (African Harrier-Hawk) and a Yellowbilled Kite have been observed flying low over the garden a few times this month. Not Redwinged Starlings this time, but a flock of Whiterumped Swifts sent the Gymnogene on its way recently. I felt privileged to have a wonderful view of an Olive Woodpecker only metres away from me very early the other morning. 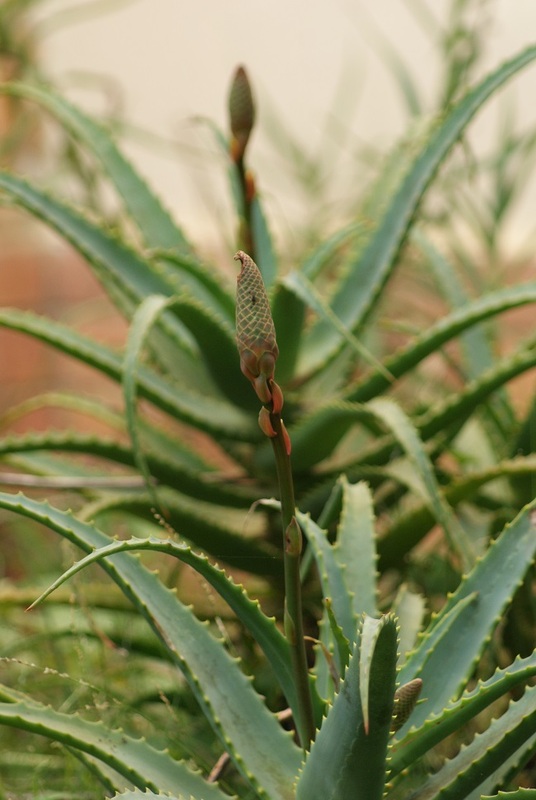 It spent nearly ten minutes investigating the lower sections of the grove of pompon trees and making its way through the aloes. While I have become accustomed to the harsh sounds of the Black Crows flying overhead or squabbling as they perch near the top of the cyprus tree next door, small flocks of Pied Crows have become more evident this month. 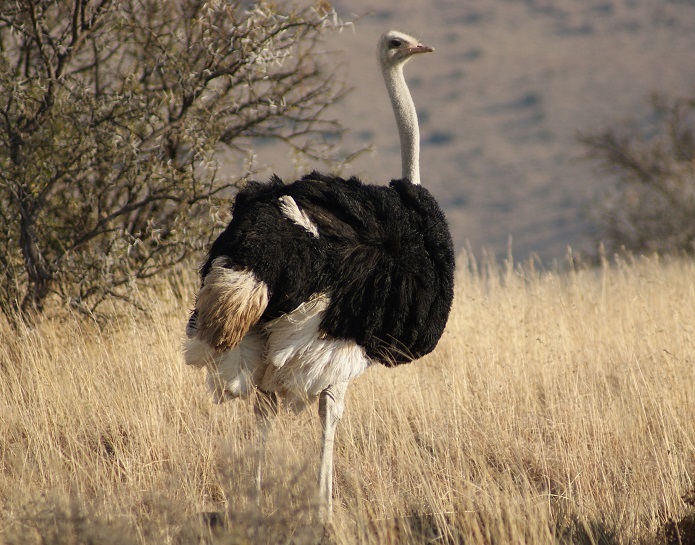 Shortly after entering the dry looking winter veld in the Mountain Zebra National Park near Cradock, we came across two of South Africa’s iconic creatures: Ostriches and Springbuck – the latter being a national emblem. We were to see many more of both during our three-day stay in the Park. Game viewing was good during the 12 Km stretch of road leading from the entrance gate to the reception and the camping area. 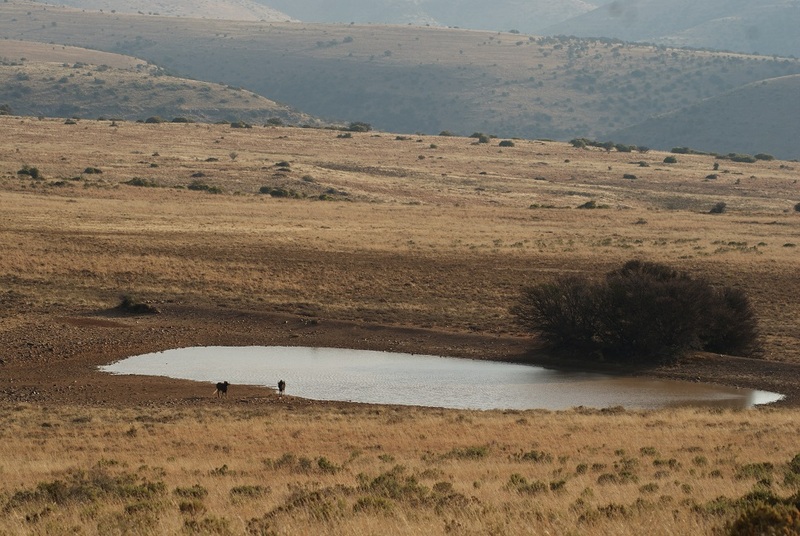 Black wildebeest snorted and waved their characteristic white tufted tails; a Yellow mongoose watched us curiously from the safety of the straw-coloured grass; and we were thrilled to see a sizeable herd of the Cape mountain zebra this park was established to protect. A lone Red hartebeest eyed us dolefully from its sitting position in a bare patch of veld – we would see herds of them during our game drive later that afternoon – and it was surely the same one guarding its patch when we drove past that spot on our way out of the park! A rather woolly-looking Gemsbuck moved slowly away from the road as we approached, giving the impression that time was not an issue in this part of the world. 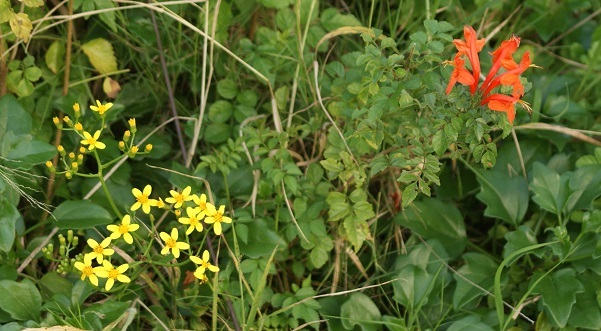 Perhaps it was because we had chosen a mid-week stay that we had a completely free choice of campsites on our arrival. The only restriction was that some of the sites were being soaked by sprinklers to encourage the growth of patches of lawn. A caravan arrived later on and parked some distance away. Having enjoyed a leisurely late afternoon game drive on the high plains, where we had seen large mixed herds of antelope, we appreciated the peace mantling the camping area as the sun set. The silence was broken now and then by the piercing calls of Black-backed jackals in the distance and the gentle cooing of Cape turtle doves in the trees. Some Red winged starlings called briefly as they swooped past to their evening perches, followed by a duet of Boubou shrikes and the characteristic chirping of the Bar throated apalis emanating from the tangle of acacia trees bordering the campsite. A gibbous moon rose much later, bathing the camping area in a soft, silvery glow that rendered the use of torches unnecessary when moving about in the evening. Bird watching while driving wasn’t easy. Many of the birds recorded are familiar enough from my garden and the surrounding area. I was most pleased to see a Hamerkop though, as it is a familiar bird from my childhood years. I got to know it well for it frequented our farm dams. Even though this species has an extensive range throughout the country, I seldom see Hamerkops anymore and I miss its presence where I live now. 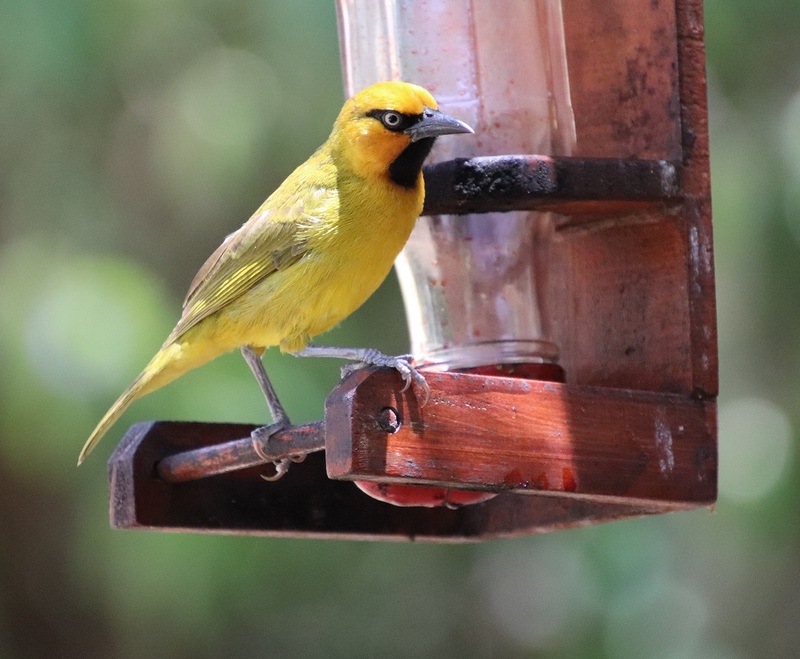 A dark theme threaded its way through my bird watching this morning, which started with a dashing looking Blackheaded Oriole swooping after another – clearly spring is in the air – chasing it all over the garden before halting to fill up from the free nectar in the ‘pub’. That tranquil moment lasted only until the Forktailed Drongo dive-bombed the oriole to get its share of the energy drink on this chilly day. Later, this black bundle of aggression chased away both a Laughing Dove and a Village Weaver that happened to beperched nearby. Blackeyed Bulbuls chirped cheekily at this activity then slid down the branches to investigate what was on offer at the feeding station. As they did so, a large and raucous flock of Redwinged Starlings flew past casting shadows over the dessicated lawn and dappling the swimming pool. A pair of Blackcollared Barbets called out to each other from the top of the Erythrina then chased each other into the fig tree to continue their courting sounds whilst being well hidden by the foliage – their sense of the onset of spring is much stronger than mine! Even some of the weavers are beginning to loop blades of grass over thin branches as if trying to remember how to start building a nest. The striking colour of black in birds was weaving its way through my mind when I commented on the shining beauty of the Black (Amethyst) Sunbird taking advantage of the lull to get its share of the ‘pub’ before investigating the bright orange flowers of the Leonatis leonuris I had pruned earlier. “What is a black swan?” B asked over tea. That’s easy, I thought until he qualified the question with “I don’t mean the bird.” That stumped me – I am not at all familiar with the term. It turns out to refer to a completely unexpected event that would have been very difficult to predict. The term was popularised by Nassim Nicholas Taleb in 2007. Such an event not only comes as a surprise, but has a major impact – such as those aeroplanes flying into the twin towers of the World Trade Center; an event now referred to simply as 9/11.